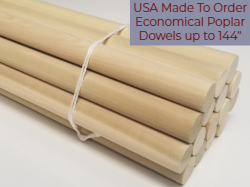 USA Made, Kiln dried Red or White Oak Dowel Rods - clear, smooth and accurately sized. 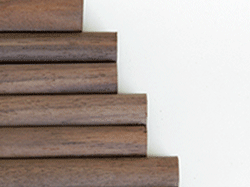 Select Pre-Bundled Oak Dowels in 36" or 48" Lengths. 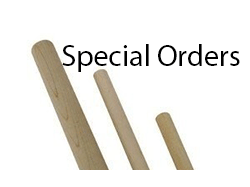 Competitive Pricing Either way - Purchase Pre-bundled Oak Dowels or Request a Custom Quote. 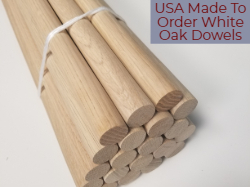 1) Select a convenient bundle of Red Oak dowels by length / diameter below.Or Contact Us for a custom size or quantity of Oak Doweling. Prefer White Oak? 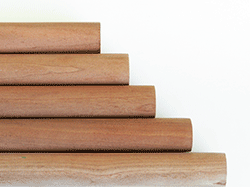 We can help as well - prices are about 10% higher than Red Oak and we'll do up a custom quote. 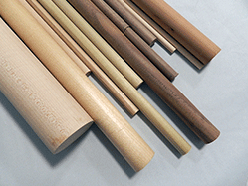 3) Oak dowel rods are made to order and will be subject to a lead time - generally 2 weeks. Need them faster? Contact us and we'll see what we can do to help. 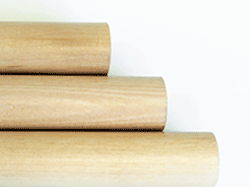 4) Some single dowels are available - check options here. 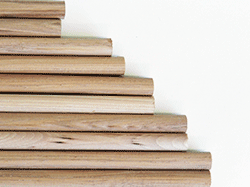 About the Oak that we turn into Dowels. Oak (Red Oak Group) Most red oak comes from the Eastern States. 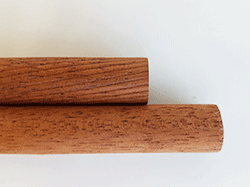 The sapwood is nearly white and roughly 2 to 5 cm (1 to 2 in.) wide. The heartwood is brown with a tinge of red. Wood of the red oaks is heavy. Rapidly grown second growth wood is generally harder and tougher than finer textured old-growth wood. The red oaks have fairly high shrinkage upon drying.The red oaks are primarily cut into lumber, railroad crossties, mine timbers, fence posts, veneer, pulpwood, and fuelwood. Ties, mine timbers, and fence posts require preservative treatment for satisfactory service. 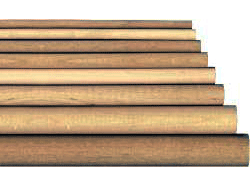 Red oak lumber is remanufactured into flooring, furniture, general millwork, boxes, pallets and crates, agricultural implements, caskets, wooden ware, and handles. It is also used in railroad cars and boats. 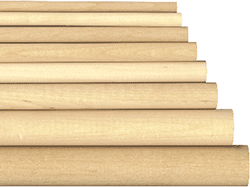 Economical Poplar Dowels up to 144"